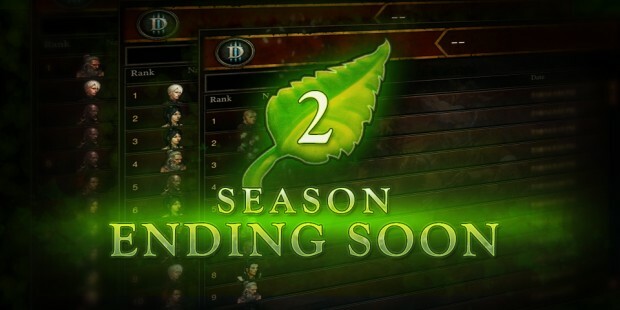 Diablo III Season 2 is coming to an end in two weeks! The current season will wrap up on Sunday, April 5. Season 3 will begin on the following Friday, April 10. From the previous announcement, we know that the new patch will arrive between those two points. So we can expect Patch 2.2 to go live on Tuesday, April 7. Now is the time to finish leveling up your Season 2 heroes and get any Conquests that you can! If you haven't experienced the end of Season, there's a lot to know about what happens to your gear, progress, and characters. Don't fret! We're here to give you a full overview of what to expect and fill you in on the details of when the current Season will end and the next one will begin. If your non-Seasonal heroes are currently at the Blood Shard cap, any Blood Shards you earn once the Season ends will temporarily ignore the cap. You can spend these at your leisure; however, note that you cannot pick up any additional Blood Shards untill you are below the current cap. Items that are currently equipped on a hero or that hero's inventory will stay on that hero as it moves to a non-Seasonal game mode. All players who reach level 70 on a hero in Season 1 will unlock exclusive Boots and Pants transmogrification appearances. These appearances will unlock immediately upon hitting level 70 on a Seasonal hero, and will be available on Seasonal and non-Seasonal heroes alike (even before the Season concludes). To access your new appearances, simply visit Miriam the Mystic and open the Transmogrification tab. For time zone assistance, click here. We look forward to seeing you in Season 3! How have you fared during Season 2? What was the highest Greater Rift you reached? Did you complete any Conquests? Any other exciting accomplishments to share? Let us know in the comments and prepare yourself — Season 3 is just around the corner!